5 Bottles of 8 oz. Blue Magic All Purpose Waterbed conditioner. Controls growth of odor and helps Prevent Algae & Bacteria from building up inside your mattress. One step time released formula. Helps remove gases from water. If you have a Free Flow, Semi Wave or Waveless then this is what your mattress needs. Conditioner will help prevent the vinyl from drying and getting hard which could lead to cracks and splits. Protects vinyl, fiber and foam. Blue magic directions -for king, queen and full size add 8oz every 10-12 months for smaller beds like twin add 4oz. Blue Magic has been manufacturing quality waterbed and bedding products in the U.S. Since 1978. S/H cost For the 50 U.S. States is included. 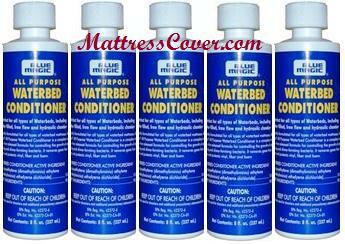 This is for Five 8oz bottles of Blue Magic All Purpose Waterbed Conditioner at a low price.